Consciousness - What is REAL? Germanwings Flight 9525 Media/Military Cover Up? Thrive - What on Earth Will it Take? Is Eating Coffee Beans Actually Good For You? Guidestones - The Award winning web series, click here. The Georgia Guidestones is a large granite monument in Elbert County, Georgia, USA. A message comprising ten guides is inscribed on the structure in eight modern languages: English, Spanish, Swahili, Hindi, Hebrew, Arabic, Chinese, and Russian. A shorter message is inscribed at the top of the structure in four ancient languages: Babylonian, Classical Greek, Sanskrit, and Egyptian hieroglyphs. The monument, often referred to as an "American Stonehenge”, is almost 20 feet (6.1 m) tall and made from six granite slabs weighing more than 240,000 pounds (110,000 kg) in all. One slab stands in the center, with four arranged around it. A capstone lies on top of the five slabs, which are astronomically aligned. An additional stone tablet, which is set in the ground a short distance to the west of the structure, provides some notes on the history and purpose of the Guidestones. Ten guidelines or principles are engraved on the Georgia Guidestones in eight different languages, one language on each face of the four large upright stones. Maintain humanity under 500,000,000 in perpetual balance with nature. Guide reproduction wisely — improving fitness and diversity. Unite humanity with a living new language. Rule passion — faith — tradition — and all things with tempered reason. Protect people and nations with fair laws and just courts. Let all nations rule internally resolving external disputes in a world court. Avoid petty laws and useless officials. Balance personal rights with social duties. Prize truth — beauty — love — seeking harmony with the infinite. Be not a cancer on the earth — Leave room for nature — Leave room for nature. The four outer stones are oriented to mark the limits of the 18.6 year lunar declination cycle. The center column features a hole through which the North Star can be seen regardless of time, as well as a slot that is aligned with the Sun's solstices and equinoxes. A 7/8" aperture in the capstone allows a ray of sun to pass through at noon each day, shining a beam on the center stone indicating the day of the year. A few feet to the west of the artifact, an additional granite ledger has been set level with the ground. This tablet identifies the structure and the languages used on it, lists various facts about the size, weight, and astronomical features of the stones, the date it was installed, and the sponsors of the project. It also speaks of a time capsule buried under the tablet, but the positions on the stone reserved for filling in the dates on which the capsule was buried and is to be opened are missing, so it is not clear whether the time capsule was ever put in place. Each side of the tablet is perpendicular to one of the cardinal directions, and is inscribed so that the northern edge is the "top" of the inscription. The complete text of the explanatory tablet is detailed below. The accompanying image shows the overall layout. The tablet is somewhat inconsistent with respect to punctuation, and also misspells "pseudonym". The original spelling, punctuation, and line breaks in the text have been preserved in the transcription that follows. At the center of each tablet edge is a small circle, each containing a letter representing the appropriate compass direction (N, S, E, W). Around the edges of the square are written the names of four ancient languages, one per edge. Starting from the top and proceeding clockwise, they are:Babylonian (in cuneiform script), Classical Greek, Sanskrit and Ancient Egyptian (in hieroglyphics). (The words appear as shown under the time capsule heading; no dates are engraved). 1. OVERALL HEIGHT - 19 FEET 3 INCHES [5.87 m]. 2. TOTAL WEIGHT - 237,746 POUNDS [107,840 kg]. AN AVERAGE OF 42,437 POUNDS [19,249 kg]. 4 INCHES [2.24 m] LONG 2-FEET [0.61 m] WIDE. WEIGHING AN AVERAGE OF 4,875 POUNDS [2,211 kg]. WIDE, 1-FOOT, 7-INCHES [0.48 m] THICK. WEIGHT 2,707 POUNDS [1,228 kg]. 8. 951 CUBIC FEET [26.9 m³] GRANITE. 9. GRANITE QUARRIED FROM PYRAMID QUARRIES LOCATED 3 MILES [5 km] WEST OF ELBERTON, GEORGIA. In June 1979, an unknown person or persons under the pseudonym R.C. Christian hired Elberton Granite Finishing Company to build the structure. One popular hypothesis is that the patron's pseudonym may be a tribute to the legendary 17th-century founder of Rosicrucianism, Christian Rosenkreuz. 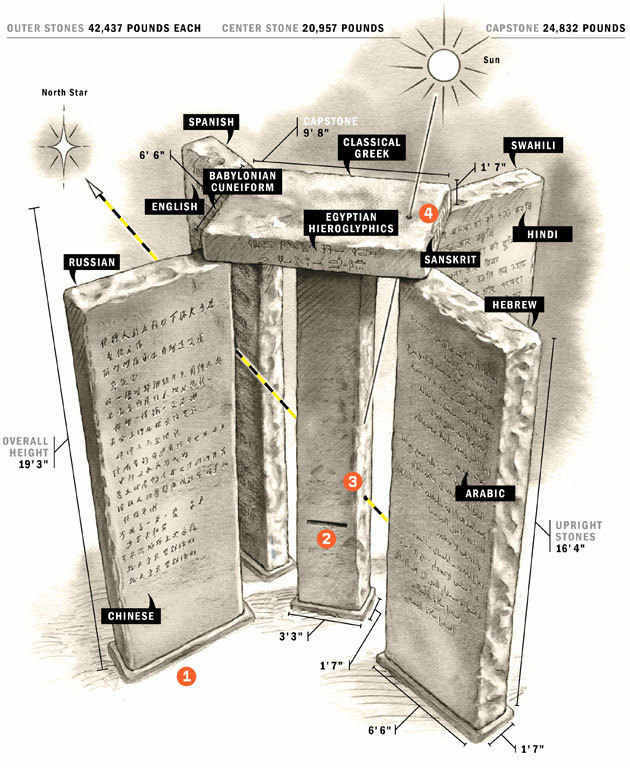 Popular conspiracy theorist, Alex Jones, in his 2008 documentary 'Endgame: Elite's Blueprint For Global Enslavement' highlights "the message of the mysterious Georgia Guidestones, purportedly built by representatives of a secret society called the Rosicrucian Order or Rosicrucians, which call for a global religion, world courts, and for population levels to be maintained at around 500 million, over a 6 billion reduction from current levels. The stones infer that humans are a cancer upon the earth and should be culled in order to maintain balance with nature." An activist named Mark Dice, demanded that the Guidestones "be smashed into a million pieces, and then the rubble used for a construction project," claiming that the Guidestones are of "a deep Satanic origin," and that R. C. Christian, belongs to "a Luciferian secret society" related to the New World Order. And at the unveiling of the monument, a local minister proclaimed that he believed the monument was "for sun worshipers, for cult worship and for devil worship". 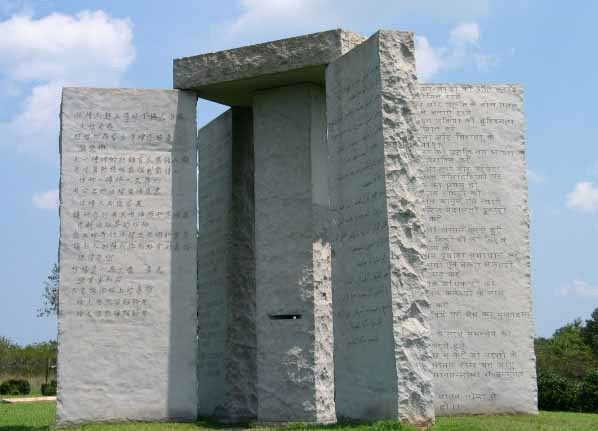 The Guidestones describe the new world order plans and the United Nations Agenda 21 and operations such as codex alimentarius mirror this ideology of sustainable development through depopulation. 1. The monument sits at the highest point in Elbert County and is oriented to track the sun's east-west migration year-round. 2. On an equinox or solstice, visitors who stand at the west side of the "mail slot" are positioned to see the sun rise on the horizon. 3. An eye-level hole drilled into the center support stone allows stargazers on the south side to locate Polaris, the North Star. 4. A 7/8-inch hole drilled through the capstone focuses a sunbeam on the center column and at noon pinpoints the day of the year.